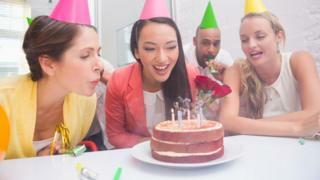 Having cake at work to celebrate colleagues' birthdays, engagements or just surviving the week is a danger to health, a senior dentist argues. Prof Nigel Hunt, from the Faculty of Dental Surgery, at the Royal College of Surgeons, says "cake culture" is fuelling obesity and dental problems. At the organisation's annual dinner for dentists, he will say workplace temptation stops people losing weight. And staff should be rewarded with fruit, nuts or cheese instead. In the speech, he will say: "Managers want to reward staff for their efforts, colleagues want to celebrate special occasions, and workers want to bring back a gift from their holidays. "But for many people the workplace is now the primary site of their sugar intake and is contributing to the current obesity epidemic and poor oral health." He will say nearly 65,000 adults every year need hospital treatment for tooth decay. Prof Hunt will say: "Cake culture also poses difficulties for those who are trying their hardest to lose weight or become healthier - how many of us have begun such diets only to cave in to the temptation of the doughnuts, cookies or the triple chocolate biscuits?" While he does not believe office cake should be banned, he will say it should be purchased in smaller quantities and consumed only with lunch. Dentists recommend cutting down on sugary or starchy foods between meals as they give bacteria fuel to produce acids that decay teeth. At the dinner, which is being rounded off with mint panna cotta, British strawberries and chocolate soil, Prof Hunt will say: "Ideally office workers should consider other alternatives altogether like fruit platters, nuts, or cheese. "Responsible employers should take a lead and avoid such snacks in meetings."